It's Walky! » So who’s the traitor, now? “Join Beef with me” is a terrible pick-up line. It kind of feels like we skipped a comic? I’d have to go back and check to be sure, but I seem to recall going into more detail on Linda’s deal with the Head Alien. I like how Jason apparently took Penny’s monologue as a distraction to drop off Beef and slip away bit. You know, Penny, that argument might have carried more weight before you had your people indiscriminately murder several of their friends. Like this is the second time they tried to kill them and they brainwashed a few others to try to kill themselves. It feels like she’s too crazy to actually achieve whatever goal she was aiming for. I don’t think it was ever explained what any of the Britjas wanted. It has often seemed to me that Early Willis just plain forgot that he hadn’t actually explained a lot of things to us. Holy Crap! I posted within the 30 second window when this comic existed yesterday? Awesome! But even more damnably evil. Red hair, green eyes, commonwealth accent, pure damnable evil. Eh, three out of four ain’t bad. Though her argument would have held more water if Beef hadn’t just killed at least two of their allies in the last 5 minutes. Joyce’s pose kind of makes her look like she’s jumping up to give them the biggest hug ever. Which honestly wouldn’t be all that surprising now that I think about it. She’s going to hug them to death Elmyra-style. …which, in effect, joins Beef and Penny, as Penny requested. Ugly world with impossible odds and such yadda yadda, why is Joyce starting to sound like the actor that played Katara in that Ember Island play episode? I know that this ISN’T a Rorschach reference, since I doubt that was part of David’s formative comic influences, but I absolutely see Rorschach there. Not that that’s a bad thing, sometimes you need someone to draw a hard line in the sand. It’s not a Rorschach reference, but I did read Watchmen in freshman year of college. It was part of an elective course on comics I took. Whenever a villain says “it’s the only way”, that almost always means it’s not actually the only way. I know they all just stare at mama Walketron, but I feel this as a fourth wall break. I adore Sal’s face like : WTF??? Are you for real??? Honestly, I think Joyce is the wise one here for refusing to go along with the retcon shock. 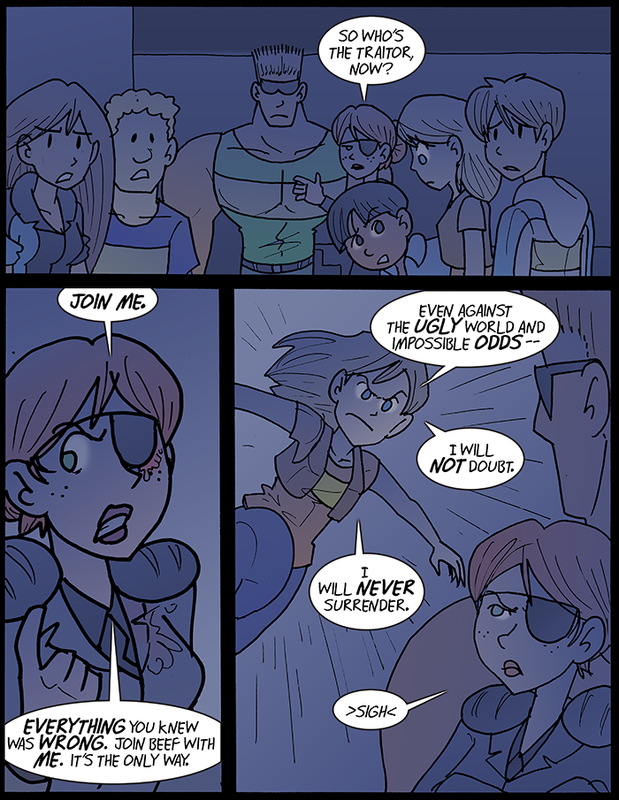 Linda may be a nightmare, but she’s not the one who killed three or six named characters in front of our eyes and presumably others, one of them at the beginning of the “we should all be on the same side” speech. There are literally dozens of bloodless or nearly bloodless ways Penny could have made this appeal, now or earlier. She’s a psychopath, and that evident fact eclipses all others. She’s not being wise. She’s making the right choice for the wrong reason. 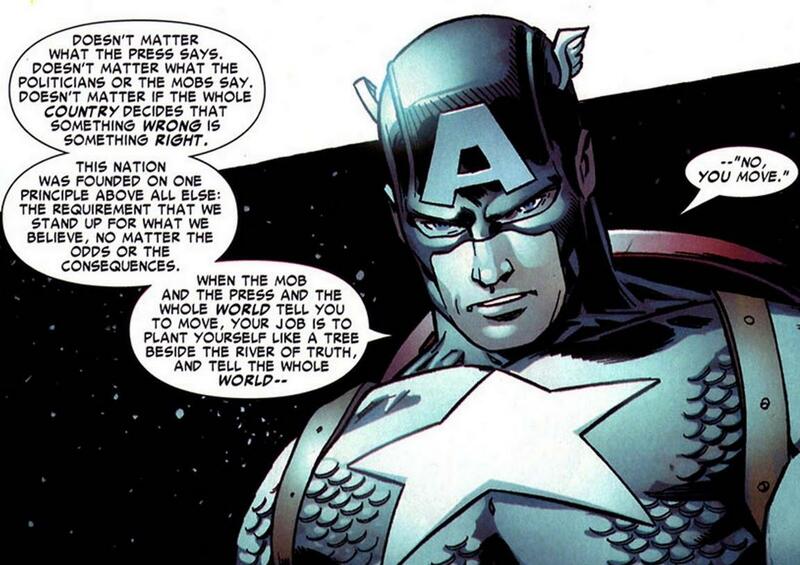 Just like that one Captain America quote everyone seems to love. You know the one. Well, what some of those people miss is that “the river of truth” isn’t always so easy to find, and Cap at his best does a lot of soul-searching on a regular basis about where it is. But honestly, I can’t get my head around calling Penny’s diatribe here “evidence” or “reason” except to have a little fun with Joyce’s similarly context-vulnerable speech. Okay, Penny’s revealed that her organization manipulated Linda, who in turn worked with the Head Alien to create what became SEMME. But that’s reasonable evidence that… the “only way” is to join Penny, now? No! Come on! Penny and Beef killed Guns three freakin’ seconds before this monologue began, and don’t tell me he couldn’t have simply swatted her unconscious or disarmed her easily. Furthermore, if Penny’s group really does “own” SEMME, why have these two armed raids even been necessary? They can plant Linda at the top of the organization, but they can’t send a video email? Why is her appeal to her “new allies” decorated with their corpses? I’ll tell you why: because like Jason Chesterfield before her, Penny wants it like this. She doesn’t want allies, she wants underlings. She’s not out to shake hands, she’s out to crush spirits. She wants to bully these upstart superhumans and knock down their beliefs until they have no gods but her. The verifiable facts she’s got and the loss of the group’s government support and mission statement make her more effective at this than she otherwise would be (again, the fact that she’s crunching through cast members like potato chips would ordinarily be a pretty big tip-off). So I understand why they wobble. But there are deeper, more fundamental things to believe in that don’t change just because you lose your paycheck or your faith in those who deliver it– just ask the people striving to do good work in government service lately– and that’s why not a single person here is actually going to take Penny’s offer. Joyce has always had a greater ability to believe than anyone around her. At this moment, that’s an asset, and a commendable one. Um, do you mean Dargon? Or have I missed something? You were watching Galaxy Quest when you wrote this panel.